As I was sitting at my kitchen table typing away at the DigiDuck collaborative novel today, I looked over at the wine bottle from last night’s cheap Chilean Pinot, “Flip Flop.” And, perhaps because I am living under a heightened awareness of information and the digital this month, I was struck by the tremendous verbal and visual noise emanating from that label. This label is all business in the back. Now I may be dating myself here, but when I was first learning about wine, labels were part of a mysterious language that took years to master. The best labels, it seemed, far from cluing the average wine drinker in to the qualities found therein, were something that, if anything, stood in the way of one’s understanding of the ruby liquid inside. My fellow wine drinkers and I would stand frozen in the aisles of wine shops, staring at the spare lettering and occasional etched estate portrait on each bottle, looking for a sign: If we just looked hard enough, long enough, the wine would speak to us, tell us that yes, this was going to be a good bottle–or no, it would not be coppery tinny syrupy undrinkable. And so today, I noticed this empty Flip Flop bottle on the counter in front of me, and suddenly I saw that something had changed since those days of cheap Chilean wine in Cambridge, Mass. A concatenation of multiple symbolic economies converged on a winey purple bulletin board pasted onto the bottle, and aimed, it seemed, at me, the way that the backs of cereal boxes are aimed at kids. Here was Information. Here was Knowledge. Here was everything I needed to know about Flip Flop wine without ever experiencing it. Here was wine sans oenologist. No advice needed from the creepy man behind the counter. I suddenly became aware that this label was interpellating me as a wine consumer and was laying claims on my ability–no, my desire— to process a wealth of label information, to understand all that was suitably packaged for my consumption. Thus called upon, I looked more closely: To start, there is a series of icons to guide me, thus welcoming even the semi-literate to Information. The first icon, a person sipping a glass of wine. “Oh, good. Now I will know how it will taste.” Apparently it’s going to be medium bodied and structured—surprising, I thought, that it comes with any structure, given the price tag ($6.99). It’s got reliably positive words to go with it, wine-wise: “bright cherry” (that’s gotta be better than dull cherry), “sweet spice” and “supple, velvety” finish. Any gal who doesn’t like her velvet supple, well, I’ve not met her. This is all good. The next icon to comprehend is a knife and a fork. Surely there is no mystery here: I will now know what food I might eat with this velvety and supple Pinot. Cola and some vanilla here, great for the $6.99/bottle crowd (who I presume drink Vanilla Coke prior to the much-awaited 5 O’Clock. Not me, mind you, but others–those who like their wine with lots of vanilla.) The menu, too, appeals: bacon wrapped shrimp and mahi-mahi. Who doesn’t like bacon? No one, that’s who. And chocolate chip cookies? I hadn’t thought of that but the wine aisle is just one aisle down from the Ghiradelli…. I see another icon, which looks like a Likert scale, and lucky me, I was a psych major so I know what that means. On one end there is “Dry” and on one end there is “Sweet”—and two Mediums (yes, two mediums) in between. I am comforted to find a distinctly reassuring triangle floating just above and between “Dry” and “Medium Dry”—thus suggesting that this is not Boone’s Farm. Having drunk the wine because it was available, I’m happy to know where it stands on the Likert. Anyone who can tolerate a dry wine is perhaps not merely drinking for the numbing effects of the alcohol and sugar but rather shows a bit of discernment. Once again I feel I am being called upon here by this Information. Ok, this label is starting to convince me in ways that the sommelier was never able (well, of course, it’s the next morning and my husband and I drank the bottle without ever reading any of this, but that’s beside the point). For one thing, what sommelier has ever contributed her earnings to a shoe charity? That’s right, I said “shoe charity.” (If you look closely, you can see the shoe icon.) Now why references to the smell of feet and the taste of wine (and bacon, don’t forget bacon!) should present themselves on the same bottle I’m not quite sure….Could it be that this wine’s got “legs” and thus needs shoes? Who knows? But I’m happy that needy children will be shod in flip flops because I’ve sipped Flip Flop. Such delightful information here, and I don’t have to be at all embarrassed by my curiosity. No salesman looking down his nose. No questions about what I intend to pair Flip Flop with. Just straightforward Information. 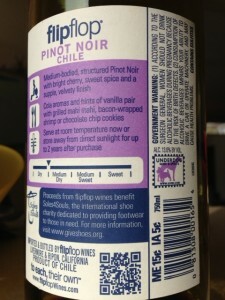 Scrolling down the label I discover that besides liking feet, Flip Flop the California company (although perhaps not Chile, these Pinot grapes’ country of origin), embraces a distinctly American wine-eology, that is to say, “to each, their own.” No icon here, just words. Good, I am called upon to remark. I’m glad we each get to have our own. I won’t have to share my next bottle of Flip Flop. But at such a rate of consumption I can hardly see how any bottle could last on a shelf out of direct sunlight for 2 days, let alone 2 years. Twirling the bottle just a bit, I see that if wine is a language all its own, surely this wine shares its message with at least two machines. 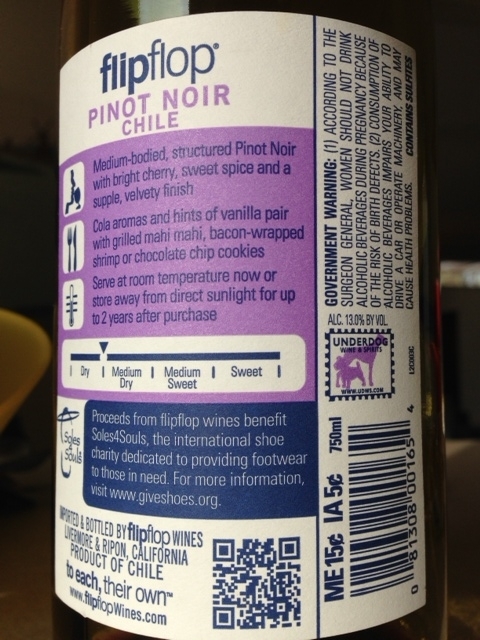 Two icons on this label are not meant for me or any drinker to read at all: Flip Flop has both a bar code and a QR code, whose audiences are clearly as-yet-unmet (love?) machines. I note that this bottle has ushered us from Oenology to Object Oriented Ontology. And then, my least favorite wine information, the language of compliance: reading sideways, we see that Flip Flop is 13.5% ALC by VOL. And we are warned in no uncertain terms that while yes, Italian women (and maybe others) have been drinking wine when pregnant for generations, the surgeon general does not approve. And we are also told, in case we were not aware, that Flip Flop could impair our ability to drive a car or a combine, and so these things should be avoided. I’m so glad that this Information, and not just the bacon-wrapped shrimp menu suggestion, are included. I am also cheered to know that in both Iowa and Maine, this bottle is worth 5 cents and 15 cents respectively. Global warming and all that. Whew! That is a lot of information. Now I feel confident. Now I feel like this is the right bottle for me now, as it was last night. And I’m so glad I can just scan another one exactly like it at Albertson’s and I don’t have to talk to anyone about my choice (“to each, their own!”). But really, I miss the mystery. And frankly, after all that Information, I really need a drink. Loved this hilarious, sly, intriguing stroll through the wine label, the wine aisle, and the label-writer’s fancy. “It’s all happening!” (great all-purpose phrase of the ’60s) comes to mind–at least, on this wine label it is. we were just drinking Pinot Noir tonight! what a fabulous subject! Total information overload from one wine label. Nothing is left to chance. went to their site where you can download a PDF of the Tasting Notes…so if you don’t like it, it must be because you didn’t follow the instructions carefully. Wonderful post. Funny and trenchant (with top-notes of satire and vanilla !) Yes that is a TMI label – i agree about the loss of mystery and wonder too if the over-inscribed labels are a way to re-brand ‘cheap wine’ as hip and ironic. Okay I totally need a drink – with you! :) Great, great piece. I’ve always loved wine labels too. So many of them are pieces of art! Then again, even bad art “reduces well.” Can’t wait till your next piece!